WOW! What a great project!! Happy Holidays! That's is a cute gift to give away Amber! 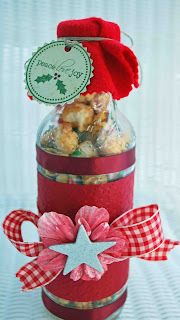 :) Is it caramel popcorn? Anyway, looks yummy! That looks so nice and yummy!! The card goes with is so well. Adorable little set Amber. What lucky friends you have. I would love to be your neighbour!!! Oh my goodness what a beautiful gift. I LOVE the bows and stars and of course the CB paper! Your vintage looking card is the perfect addition. Wow...what a great idea for the Sobie bottle! Nice job. Also love the card that goes along with it...the image is GORGEOUS! I love your work...I'm a follower now! Love the bottle -- the contents look awfully yummy! What a great gift idea and a gorgeous card! I'm now a follower! Merry Christmas! I love the effect that the inked embossed dots made on the card. What a great idea! Is this lovely gift on its way to my house? Heehee! That candy bottle looks so festive. Love it!!! You come up with the best things!!!! I filled my bottle with toffee popcorn from walmart. It's got red and green candy drizzled over it. A very nice gift set. Lovely card! The bottle is a great idea. You made it look so fun and festive. Amber I always enjoy your projects, they are always so pleasant and personable...just like you. This project is really cool! thanks for the inspiration. love the card- it is beautiful! The card and bottle are perfect together. It would be lovely to give someone special this gift. Love your project and the card. Thanks also for offering additional candy! I'd love to win, and I love blog hops! I love 3d stuff. Awesome. I'm now a follower and thank you for sharing your creations! Cool projects! I love my Cuttlebug too. Happy Holidays. Great project Amber. I love that card, you did an awesome job. Everytime I visit your blog I am amazed at how much you have grown as a crafter. Merry Christmas. Wow these are just beautiful. Merry Christmas! Suuuweet treat with an even suusweeter card! Gorgeous card! I love the treat bottle. I haven't gotten into altering items yet, but now I just may have to. Your blog's creations are inspirational and exciting and fresh. I hope you had a Very Merry Christmas... may God bless you and your family richly in the coming year! Just love, love, love your project and that card is so beautiful. I have just become a follower. What a gorgeous project. Hope you had a great Christmas. 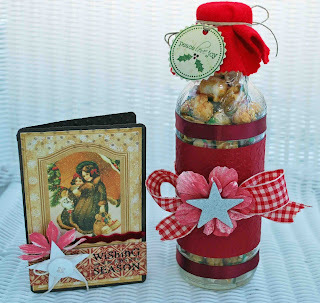 great bottle and fab vintage christmas card.......thanks for giving the chance to win a mini kit! Absolutely love both projects. What a great idea. Love the vintage feel of the card as well. TFS. 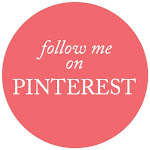 I am a new follower - great to meet you during this blog hop! I love your bottle. I also did little soda bottles and filled them with gift cards for my niece and nephews! they thought it was the coolest present ! I absolutely love you bow! Just gorgeous, as always :o) Hope you had a blessed Christmas!! 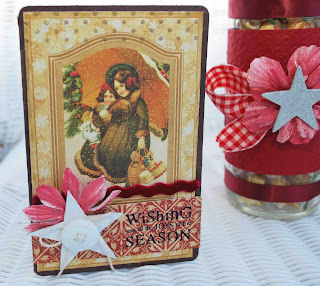 Thank you for the op to hop along and have fun on this wonderful blog hop!! Awesome Projects! Hope you had a good christmas and a Happy New Year to you ! Very Cute Gift!Forgot to add I am a Follower!